CAIRO, (Reuters) – Egypt’s interim authorities, boosted by $8 billion in Gulf aid, start work on forming a cabinet yesterday, a week after the elected Islamist president was ousted by the army leading to a wave of violence in which at least 90 people were killed. Wrangling between political groups over a decree setting the rules for the transition, designed to usher in parliamentary elections within about six months, could point to a bumpy road ahead. Events of the last seven days are sure to overshadow the normally festive start to the fasting month of Ramadan, which begins today, with Egypt’s 84 million people more divided than at any time in their modern history. Thousands of Islamists rallied outside a mosque in northeast Cairo overnight, where they have braved the heat and dust in a 12-day vigil, refusing to budge until toppled President Mohamed Mursi is returned to power. Just a few hundred metres away, outside the military barracks where he is believed to be held, 55 Mursi supporters were killed at dawn on Monday when troops opened fire. The movement says the victims were praying in peace. The government says the Islamists provoked the violence by attacking the soldiers. The authorities announced an investigation into 650 suspects for offences from “thuggery” to murder and terrorism. Egyptian state media praised the army and denounced Monday’s violence as the work of terrorists. Amnesty International said that whether or not the security forces acted in response to provocations, they were guilty of using “grossly disproportionate force”. Egyptians are still reeling a week after Mursi’s overthrow, which initially sparked wild celebrations in Cairo and beyond by millions of people who wanted him gone, fed up with economic stagnation and what they saw as an Islamist power grab. 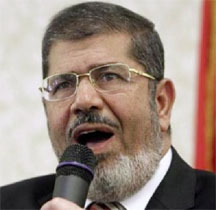 To Mursi’s Muslim Brotherhood, however, his removal amounted to the reversal of democracy by entrenched interests who would never accept their election victories. The Brotherhood denies it had an aggressive Islamist agenda. Fearing a return to the suppression endured for decades under autocratic rulers, members of the long-banned movement took to the streets. On Friday, pro- and anti-Mursi protesters clashed in running street battles that swept the country. Some 35 people were killed. “The only road map is the restoration of the president elected by the people,” said Hoda Ghaneya, 45, a Muslim Brotherhood activist. In lawless North Sinai, two people were killed and six wounded late on Tuesday when Islamist militants attacked a checkpoint, amid concern that the anger is behind a spike in violence in the region bordering Israel. Monday’s bloodshed raised alarm among key donors such as the United States and the European Union, as well as in Israel, with which Egypt has had a U.S.-backed peace treaty since 1979. Wealthy Gulf Arab states, long suspicious of the Muslim Brotherhood, stepped in swiftly with financial support that could relieve pressure on the transitional authorities at a time of economic stagnation.